If you ever wanted to be an astrophotographer, August is the perfect month to start. In the Northern Hemisphere, August nights are warm and generally clear, at least in many parts of the Western United States. More importantly, August has more beginner-level objects than any other month of the year. 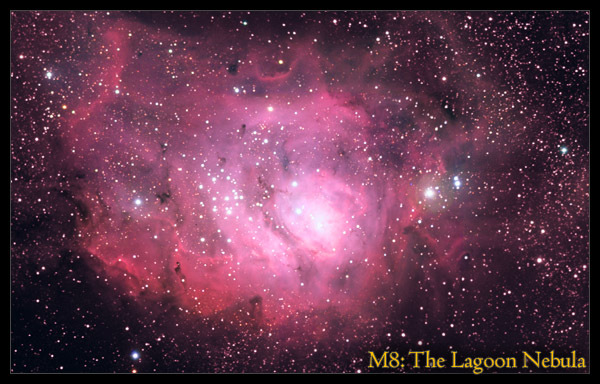 The best is probably M8, also known as the Lagoon Nebula. It is a very large and nearby diffuse nebula in the Sagittarius constellations. At a dark site you might even be able to see M8 with the naked eye, but even from a suburban backyard you should be able to capture beautiful images of it. You must overcome two challenges, however: first, M8 never rises far above the horizon, so you will need a clear view of the southern skies; and second, M8 is 90 arcminutes long (the Full Moon is only 30 arcminutes) so you will need a short focal length telescope. The popular Trifid Nebula, labeled M20 by Charles Messier, is not too far from the Lagoon Nebula. This beautiful object is fainter and smaller than M8, but its blend of red emission gasses and blue reflection clouds makes it more interesting to my eyes. 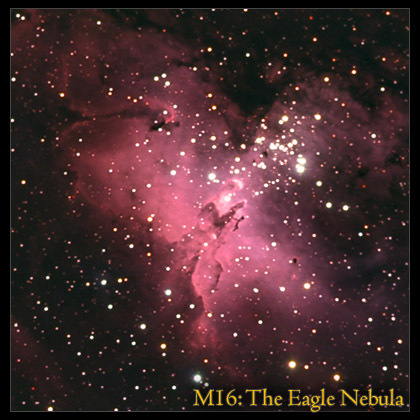 Also nearby is M16, made famous by the awe-inspiring "Pillars of Creation" image from the Hubble Space Telescope. M16 is smaller than the Lagoon Nebula, but it is almost as bright, making it very easy to capture. Advanced amateurs may want to capture M16 with narrowband filters to better reproduce (or at least evoke) the iconic Hubble image. August also has its share of easy-to-capture planetary nebulae. 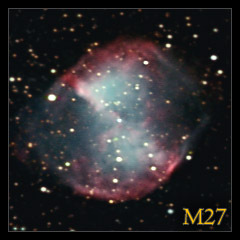 M27 is possibly the most rewarding, since it is large, bright, and colorful. Also known as the Dumbbell Nebula, M27 exhibits the typical teal color indicative of doubly ionized oxygen molecules (confusingly called OIII). You'll find it easy to capture the contrast of this bright teal against the red of the nebula's ionized hydrogen. M57 is another beautiful August planetary. Your challenge in capturing this nebula is its small size: you will need a good deal of magnification to reveal the subtle details in this ghostly ring. All five of the above objects are suitable for beginners and many will reveal great detail even with relatively short exposures.